The trend towards lighting with compact fluorescent lamps and LED downlights is constantly growing in offices large buildings. At the same time, planners are turning their attention to the overall energy efficiency of the entire building. Hence, installers increasingly encounter installation challenges from insulation and vapour barriers in areas where the lights are planned. Irrespective of the specific type of illumination selected, care must be taken that all lights are properly installed. Read here how downlight covers are an ideal solution for safe lighting installations. Downlights are popular because they add accents which contribute to the general ambience of a room. Recessed spotlights can be used to illuminate specific objects or spaces. No matter whether the choice falls on LED or fluorescent lights, special downlight covers simplify the mounting of recessed lights in insulated ceilings. Above all, they help ensure that the lighting installation complies with safety and energy efficiency requirements and reduce the risk of fire or heat damage. The new HellermannTyton SpotClip products “Kit”, “Plate” and “Box” provide ideal solutions for the safe installation of all downlight sizes. These products have been designed specifically for the larger recessed downlights which are now commonly installed in office and industrial buildings. The different downlight covers can be easily mounted in panels, grid ceilings or seamless suspended ceilings constructed from plasterboard, mineral fibreboard, MDF or chipboard. Lighting installed in insulated drywall structures always poses a latent fire risk. In the case of halogen lamps, which can generate temperatures over 200° C, it is obviously necessary to prevent direct contact between the lamp, insulation or vapour barrier. Yet, take heed: the fire risk from LED lamps should not be discounted. Their comparatively cool lamp surface is deceptive. Although they save far more electricity than halogen lamps, LED lamps convert more than two-thirds of their electrical power into heat. This heat, generated by the LED electronics, radiates from the rear of the lamp to the surrounding ceiling structure. If the gap is narrow and also filled with insulation material, then an unfavourable heat build-up can occur. The consequences can be catastrophic, beginning with lamp failure as a result of a shortened service life or even ending in a fire cause by localised overheating. The solution to these problems could not be simpler, cheaper and easier to install – namely SpotClip from HellermannTyton. With the correct SpotClip for a given light, a safe distance to surrounding insulation material can be ensured. SpotClip products minimise the risk of a fire or heat backup many times over. They are tested to EN 60598-1 and EN 60598-2-2 and are made of flame-resistant and heat-stabilised polyamide 6.6 according to UL94 V2. Like the smaller SpotClip I, II and III downlight covers for residential buildings, see the article here “SpotClip addresses fire safety hazard from down lights installed in insulated cavities“, the new SpotClip products for offices and industrial buildings are quick and easy to install without the need for special tools. This greatly accelerates the mounting of recessed lights. 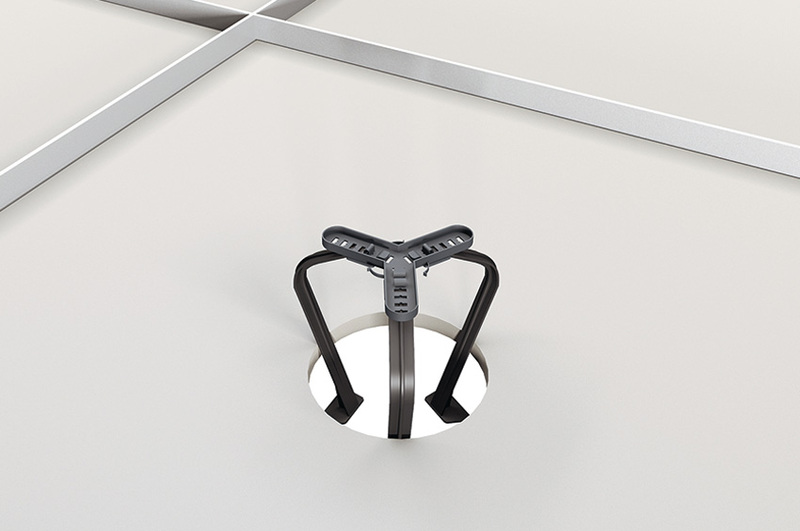 SpotClip Kit can also be inserted retrospectively, from below, through an existing hole in the ceiling. The legs are flexible so that the product can be used with different hole diameters. The kit consists of three legs and a base, which has six freely selectable slots. This means the downlight cover can be optimally tailored to fit downlights with different dimensions. The legs are available in two different lengths: SpotClip Kit 150 can be used for downlights with a diameter of 100 mm to 270 mm and a maximum height of 140 mm; SpotClip Kit 240 is suitable for downlights with a diameter of 170 mm to 310 mm and a maximum height of 230 mm. The pre-stamped plate is adaptable to the most commonly used downlights diameters, from 75 mm to 314 mm. The correct hole diameter can be easily cut in SpotClip Plate with a handsaw. The light can then be guided through the opening and fixed. SpotClip Box is designed for downlight and loudspeaker installation in passive building structures. The construction is completely air-tight and prevents ingress by insulation material, dust or dirt which can impair the function of the thermal heatsink on the rear of lamps. SpotClip Box is suitable for LED and fluorescent downlights or small loudspeakers up to a diameter of 75 mm and a maximum height of 130 mm. What is more, it can even be cast in concrete. The set is ready to use out of the box and includes HelaLux connectors, a cable tie and sealing caps. All for one and one for all! Fit for a king!